Fast and versatile optical SERS methods represent a major advance in chemical analysis of environmental samples such as water. To date, however, these ultrasensitive methods are hindered by two key drawbacks: (i) colloidal stability and (ii) chemical diversity, both arising from the compositional complexity of natural samples. 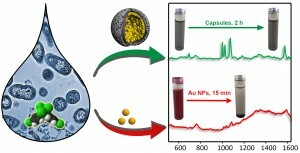 Here, we present an engineered material that, due to its unique microporous structure, imparts colloidal stability and provides selectivity while confining a densely populated film of gold nanoparticles optimized for the generation of large electromagnetic fields. The material is tested against natural water for the ultraquantification of dichlorodiphenyl‐trichloroethane (DDT), a ubiquitous environmental pollutant.